It’s been a long summer, rehabilitating from an injury acquired during the Berlin Brandenburg Half Marathon way back in April. As a result, I have not been able to work as much, and so, I have been searching for new ways to keep active. Last friday, I turned my attention to golf. Now, being from England, as well as a mother of 2 boys, my experience of golf is strictly limited to “Crazy Golf”, or the more interesting sounding “Adventure Golf” (trust me, this is no Tough Mudder!). 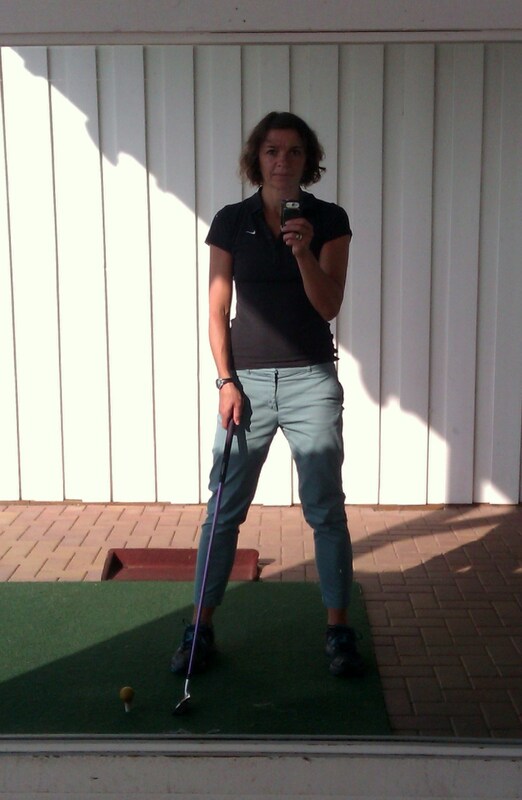 Heading off the to links or pay and play course is an alien concept to me, however, I felt determined and, thanks to a recommendation from a friend, enthusiastically booked myself my first golf lesson at Golf Resort Berlin Pankow. A close to sunrise start was rewarded with a blissfully peaceful 30 minute cycle north of the city into rolling countryside. When I arrived, a small handful of people were getting themselves ready for an early start on the lush green course. Clubs, trolleys, gloves, golf-buggies, caps, balls – quite an array of specialist kit I noticed. Reiner, my instructor soon spotted me. I’m the one with nothing but a backpack and a bike helmet of course. Thankfully he was happy to speak English with me, and promptly lead me to the driving range. Out of sight perhaps? 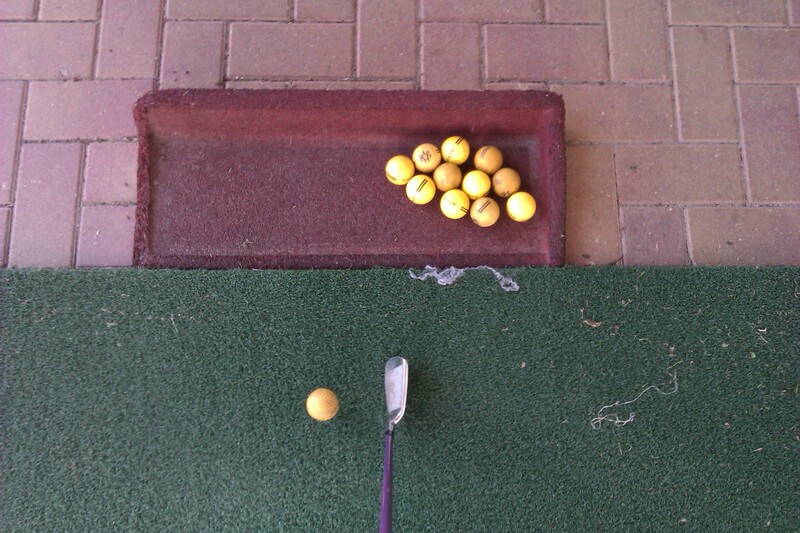 A 2 euro coin buys you a bucket of 40 balls, and before I knew it I was merrily firing balls in all directions across the driving range. Reiner’s teaching style is very patient, straight forward and kind. My main objective was to slow down and reduce the power. It would appear I have quite a lot of upper body strength compared to most women, so had to really concentrate on not allowing myself to swing my club too hard. In my mind, I was trying to stroke a labrador with a feather. The result was a whacking left swing heading the ball somewhere beyond the 75 meter flag. It seems practice, patience and plenty of time is the order of the day. To say I was determined to send a ball directly in front of me, would be an understatement. There is no doubt that I need to practice. This sport will only come good with plenty of it. 90 balls later, with Reiner long gone, I finally decided to head back home. Taking time out in the fresh air, lapping up views of a well-groomed course and endless countryside beyond, this could become a fond hobby where I can allow myself to clear my head, slow down and relax. This is a great course to learn on. It is a public course, so there are no membership fees. You can hire clubs and balls and away you go. There are huge benefits to trying a new sport. Whether you are in a training rut, or like me, injured and off your usual training routine. You will exercise new parts of your body, helping you to become fitter and stronger. Your brain will be challenged, which helps delay the onset of dementia. You will meet new people and you will have something new to talk about. Golf incorporates cardio vascular exercise (heart and lungs), strength training and of course balance and coordination. That long walk on the course can really ramp up your step count too – just make sure you leave that golf buggy at the clubhouse though! I would say, however, there are much cheaper sport options than golf, but a Pay and Play course is certainly a good way to try. You can contact the club directly and arrange a lesson of your own by following the link to Golf Resort Berlin Pankow.